Kenyan-born Abdurahman Yasin Daud is a U.S. permanent resident and convicted ISIS conspirator. 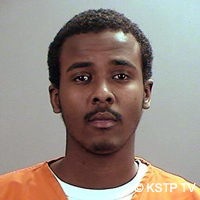 He was arrested alongside fellow Minnesotans in April 2015 for conspiring to join ISIS. The men had planned—over the course of 10 months—to travel to Syria to provide material support to ISIS.“Six Minnesota Men Charged with Conspiracy to Provide Material Support to the Islamic State of Iraq and the Levant,” U.S. Department of Justice, April 20, 2015, https://www.fbi.gov/minneapolis/press-releases/2015/six-minnesota-men-charged-with-conspiracy-to-provide-material-support-to-the-islamic-state-of-iraq-and-the-levant. Daud had discussed his desire to purchase an AK-47 in Syria in order to kill Shiites, according to an undercover FBI informant.Aamer Madhani, “3 Minneapolis men found guilty in plot to join ISIL,” USA Today, June 3, 2016, http://www.usatoday.com/story/news/2016/06/03/3-minneapolis-men-found-guilty-plot-join-isil/85355076/. In April 2015, Daud was arrested in California while attempting to purchase fake passports from an undercover FBI agent in order to travel to Syria.Laura Yuen, “Minnesota terror suspect deemed flight risk, held for trial,” MPR News, May 22, 2015, http://www.mprnews.org/story/2015/05/22/abdirahman-daud. The following month, Chief U.S. District Judge Michael Davis designated Daud as a flight risk.Laura Yuen, “Minnesota terror suspect deemed flight risk, held for trial,” MPR News, May 22, 2015, http://www.mprnews.org/story/2015/05/22/abdirahman-daud. That October, Daud was charged with a new count of conspiracy to commit murder outside the United States.Associated Press, “Superseding indictment has new details in ISIL case,” Kare 11, October 21 ,2015, http://www.kare11.com/story/news/crime/2015/10/21/superseding-indictment-has-new-details-in-isil-case/74357926/. In early June 2016, Daud was found guilty of conspiring to provide material support to a terrorist organization, as well as conspiring to commit murder overseas.Jack Healy and Matt Furber, “3 Somali-Americans Found Guilty of Trying to Join Islamic State,” New York Times, June 3, 2016, http://www.nytimes.com/2016/06/04/us/somali-americans-verdict-minneapolis-isis.html. On November 16, 2016, Judge Michael Davis sentenced Daud to 30 years in prison. Daud told the court that he hoped his fellow Muslims would not be blinded by ISIS’s ideology. He said, “I’m certainly not being persecuted for my faith. I was certainly not entrapped. I was not going there to pass out medical kits or food. I was going strictly to fight and kill on behalf of [ISIS].”“Final 3 Minnesota men sentenced in Islamic State case,” Chicago Tribune, November 16, 2016, http://www.chicagotribune.com/news/nationworld/midwest/ct-islamic-state-minnesota-20161116-story.html. He was found guilty alongside co-conspirators Guled Ali Omar and Mohamed Abdihamid Farah. The men face possible life sentences in prison.Aamer Madhani, “3 Minneapolis men found guilty in plot to join ISIL,” USA Today, June 3, 2016, http://www.usatoday.com/story/news/2016/06/03/3-minneapolis-men-found-guilty-plot-join-isil/85355076/. Among the individuals tried as part of the ISIS recruitment cell were co-conspirators Guled Ali Omar, Mohamed Abdihamid Farah, Hanad Mustafe Musse, Adnan Farah, Zacharia Yusuf Abdurahman, Abdullahi Yusuf, Hamza Naj Ahmed, and Abdirizak Warsame. Kenyan-born Abdurahman Yasin Daud is a U.S. permanent resident and convicted ISIS conspirator. “The way to fake the government, you know what I’m saying, you get a job normal, be American citizen. Wallahi (I promise by God) they’ll get off your back. Go to school full time. That’s the type of stuff.”Aamer Madhani, “3 Minneapolis men found guilty in plot to join ISIL,” USA Today, June 3, 2016, http://www.usatoday.com/story/news/2016/06/03/3-minneapolis-men-found-guilty-plot-join-isil/85355076/.